Three Israelis have been killed in the latest wave of Palestinian terrorism in the West Bank in the past week. The victims are two soldiers and a four-day-old baby who was prematurely born after his mother was shot and wounded in a drive-by shooting attack carried out by Palestinian terrorists. The terrorist attacks took place near the West Bank city of Ramallah, the de facto capital of the Palestinian Authority (PA), where President Mahmoud Abbas and most of his senior officials live and work. The car used in the drive-by shooting, which took place outside Ofra settlement, was later discovered by the Israeli army in the Ain Musbah neighbourhood of Ramallah, a few hundred meters from the private residence and headquarters of Abbas. No one is suggesting that Abbas knew in advance of the terrorist attacks. However, the response of Abbas and his top officials to the attacks raises serious doubts about their purported commitment to peace with Israel. Hours before the Ofra attack, Abbas said in a speech before leaders of his Fatah faction that he remains committed to "peaceful popular resistance" and diplomacy. "We don't believe in weapons, and we don't believe in rockets," Abbas said in a reference to the rockets launched by Hamas and other terrorist groups from the Gaza Strip toward Israel. The same Abbas who says he is opposed to the use of weapons and rockets has nonetheless failed to condemn the terrorist attacks in which these three Israelis were killed. Instead, his officials and he have been condemning Israel on a daily basis for cracking down on the terrorists. The anti-Israel incitement began almost immediately after the Ofra attack, when Abbas and his officials in Fatah and the Palestinian Authority began denouncing Israel for sending soldiers into Ramallah to search for the terrorists. Instead of condemning the murders at Ofra, Abbas's Ministry of Information issued a strong condemnation of the Israeli army for entering the offices of the Palestinian news agency Wafa. The ministry described the entry of the soldiers as an "act of terrorism" and called on the international community to hold Israel accountable for its "aggression" against the Palestinians. According to the logic of Abbas's ministry, Israeli soldiers searching for terrorists is an "act of terrorism," but not the shooting of a pregnant woman and six other Israeli civilians standing at a bus stop. The Israeli army did not enter Ramallah because Israel wants to "reoccupy" the city and reinstall the Israeli military government. This was a limited operation that lasted for a few hours and was in the context of the manhunt against the Palestinian terrorists. Abbas and his senior officials, however, have since been waging a fierce campaign of incitement against Israel and spreading lies and ridiculous conspiracy theories. Consider, for example, what PLO Secretary General Saeb Erekat, who describes himself as the "chief Palestinian negotiator," had to say about the Israeli authorities' pursuit of the terrorists. Erekat, in a bizarre statement, claimed that the Israeli "intrusion into Ramallah was carried out with the backing of US President Donald Trump." Erekat, too, called on the international community to hold Israel accountable for its "crimes" and to provide international protection for the Palestinians. What is strange about Erekat's statement is that he is suggesting that Israel needed permission from Trump to send its troops into Ramallah to catch the terrorists who murdered three people. What is also strange is that Erekat believes that the Israeli attempt to capture terrorists is a "crime" for which Israel should be held accountable in the global arena. Yet, the bizarre PA statements continue. Take the remark made by Osama Qawassmeh, a senior Fatah official and spokesmen, who claimed that the Israeli military operation in Ramallah was actually aimed against Abbas himself. For Qawassmeh, the Israeli army "stormed" Ramallah because of Abbas's rejection of Trump's yet-to-be-announced plan for peace in the Middle East. As if that were not enough, the Fatah official went on to argue that the Israeli army's attempt to catch the terrorists was also linked to Abbas's opposition to a recent US resolution at the UN General Assembly that condemns Hamas for repeatedly firing rockets at Israel and inciting violence. This absurd charge reflects the twisted logic of Abbas and his representatives in Ramallah. For them, the real problem is not the shooting of a pregnant woman or the killing of two soldiers. Instead, the Palestinian leaders, including Abbas, are pointing an accusatory finger at Israel for having the audacity to send its soldiers to capture Palestinian terrorists and prevent additional attacks against Israeli citizens. Needless to say, the Israeli soldiers who entered Ramallah never went close to Abbas's office or home and certainly had no intention of targeting him or any of his officials. In fact, not a single Palestinian Authority or Fatah official was arrested or harmed by the Israeli troops. Does this Fatah official think the rest of the world is so stupid as to believe that Israel would put the lives of its soldiers at risk by sending them to Ramallah just because Abbas has rejected a peace plan that no one has seen or knows anything about? Did any of the soldiers who entered Ramallah knock on Abbas's door and hand him a letter saying he must accept Trump's unseen plan or else he would be punished? Of course not. Here is another example of the lies and conspiracy theories promoted by Abbas's officials in the past few days. Mahmoud Habbash, who serves as Abbas's religious affairs adviser, said in response to the Israeli security measures against terrorism, that Israel and Hamas were colliding to "flip the table" in the West Bank to pave the way for the implementation of Trump's upcoming "deal of the century." It is also worth noting that Hamas has publicly admitted that it was behind the recent spate of terrorist attacks in the West Bank. Yet according to Habbash, Israel's crackdown on terrorism is nothing but a conspiracy concocted by Israel and Hamas to undermine the Palestinian Authority and pave the way for "passing the deal of the century, which is aimed at liquidating the Palestinian cause." Abbas's adviser, however, is convinced that the world is so stupid as to believe that Israel and Hamas were together behind the recent terrorist attacks. This is yet another blood libel against Israel from the Abbas and his entourage. Not only is this statement a lie as well as an insult to common sense, it almost seems lifted from a comedy show. "Almost", that is, because these apparently laughable remarks refer to a series of terrorist attacks that have claimed the lives of Israelis. As such, the statements should be taken seriously, and seen in the context of the Palestinian leadership's anti-Israel campaign of incitement and fabrications. It is precisely this sort of inflammatory rhetoric that prompts Palestinian terrorists to continue their attacks on Israel. Instead of blaming Hamas for the terrorist attacks, Abbas's office chose to hold Israel responsible for the upsurge of violence in the West Bank. "The climate crafted by Israel's policy of recurring incursions into Palestinian cities, as well as incitement against President Abbas, has led to this round of violence, which we reject," said a statement issued by the Palestinian president's office. Again, this statement shows that Abbas considers Israel's anti-terrorism measures, and not Hamas-engineered attacks, as the source of unrest and violence. The message that Abbas is sending to the world is: How dare these Israelis take security measures to stop terrorist attacks against their civilians and soldiers! Abbas is obviously afraid of condemning his rivals in Hamas for waging the latest wave of terrorist attacks in the West Bank. He knows that the day he condemns the shooting of a pregnant Israeli woman, his people will rise up against him and charge him with collaborating with Israel. 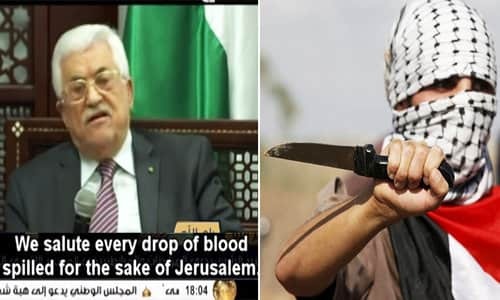 But Abbas has only himself to blame: his ongoing incitement and lies against Israel have made it too dangerous for him to utter a word against Palestinian terrorists. Finally, we might mention an important detail about which Abbas and his representatives are keeping their mouths shut tight: the Israeli crackdown on Hamas in the West Bank actually serves the interests of the Palestinian Authority. Without this ongoing crackdown, Hamas would have long ago overthrown Abbas's regime and seized control of the West Bank. It is the Israeli soldiers stationed some hundreds of meters from Abbas's office and residence that is keeping him safe and sound. As inconvenient a truth as this is for Abbas and his spin doctors in Ramallah, it is the truth, nonetheless.